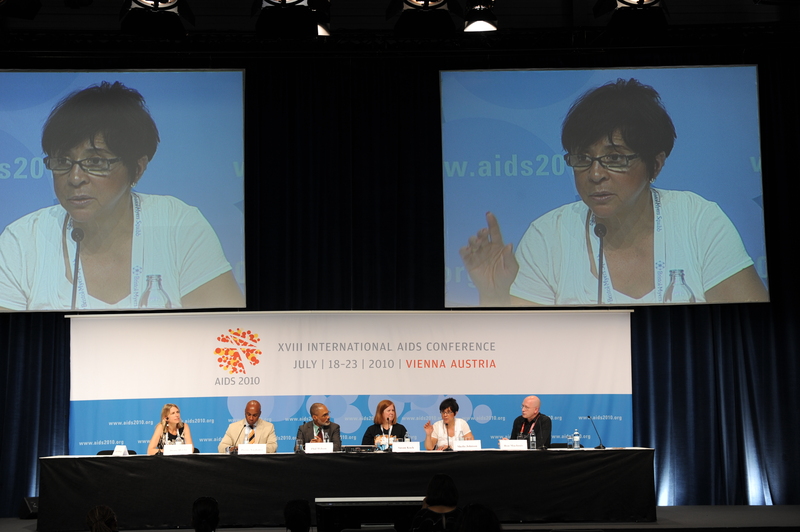 A panel discusses the documentary - The Other City - at the International AIDS Conference in Vienna, Austria. On screen is Sheila C. Johnson. Vienna, Austria (July 26, 2010) – “The Other City,” a documentary about the HIV/AIDS epidemic’s impact on the residents of Washington, D.C., screened twice at this month’s XVIII International AIDS Conference (AIDS 2010) in Vienna, Austria. The film is produced by Salamander Hospitality CEO Sheila C. Johnson and directed by Susan Koch, both of whom were in attendance. “The Other City” is a tribute to D.C.’s local heroes who are determined to solve problems that have been compounded by underfunding and lack of government support. It is also a moving reminder of the daily struggle to triumph over HIV/AIDS. More than one million Americans are living with HIV, more than half a million have died after developing AIDS and rates are actually rising in some major American cities. “The Other City” introduces us to the Washington D.C. that tourists rarely see and to residents who are both infected and affected by HIV/AIDS. It chronicles the epic struggles they face confronting social, cultural and political boundaries. Surprisingly, the very city that is home to the U.S. federal government not only has the highest HIV/AIDS rate in the country but rates that rival some African nations. 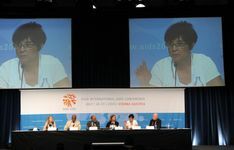 Johnson also took part in the AIDS 2010 Closing Ceremony and official hand-off from the city of Vienna to Washington, D.C., host city of the XIX International AIDS conference in July 2012. “The Other City” will have its theatrical release in the U.S. in September. For more information, visit www.TheOtherCity.com. Salamander Hospitality is a privately owned and operated company based in Middleburg, VA, just outside Washington, D.C. Founded by entrepreneur Sheila C. Johnson in 2005, the company manages and develops hotels, resorts and inns that reflect the authenticity and character of their surrounding environment, while developing a social responsibility. The portfolio includes the recently renovated Innisbrook Resort near Tampa, Fla., host to the PGA TOUR’s Transitions Championship in March and the LPGA Legends Tour Open Championship in November; Woodlands Inn near Charleston, SC, which is one of only six properties in North America to hold Forbes Five Star and AAA Five Diamond ratings for both accommodations and dining; and the under-construction Salamander Resort & Spa in Middleburg. Salamander Hospitality also operates a division of gourmet prepared food markets called Market Salamander with locations in Middleburg and Innisbrook, FL. For additional information, call (540) 687-3710 or visit www.salamanderhospitality.com. Susan Koch, left, and Sheila C. Johnson, at the International AIDS Conference in Vienna, Austria, where their documentary - The Other City - was screened.